Born in Winnipeg, Manitoba in 1909, William Arthur Winter came to know the surrounding prairies well, but his love of the flat, rolling land never really fuelled his artistic imagination. His true attention was towards the human story. Classified as a Canadian post-war modernist, he was a markedly sensitive creator whose figures assumed an almost mythical character--with wit. "Winter's wit is without bitterness,"
Paul Duval in an early interview with the artist for Canadian Review. Winter studied art under two members of the infamous Group of Seven; Frank H. Johnston and Lionel LeMoine Fitzgerald at the Winnipeg School of Art from 1923-1929. From 1930-1935 he worked as a commercial artist at Brigden’s, Winnipeg while continuing to study art. He moved to Toronto in 1937, and established an advertising firm with Lesley Wookey and Jack Bush in 1942, Wookey, Winter, Bush. Winter’s commercial work included painting cover illustrations for New World Illustrated and McLeans’s magazine. A commercial artist by day, his evenings and weekends were filled with sketching of the busy life of the city--the minutes of life--the way a person's clothing hung, the way it creased on the subject as they moved or stood. He would sketch in cafes, streetcars and street corners. He was known as an exceptionally expressive conversationalist--always wearing his signature bow-tie, a chain-smoker, diminutive in stature. People: poor people and plush people, adolescents and ancients, mean and mellow people: these are his themes. "History will be kind to William Winter. He is one of the few artists who have been able to bring to life the movement and spirit of his subjects, especially in depicting his sensitivity for children." Robert Koolen, Oakville/Stratford art dealer who has collected works by William Winter over his entire career. 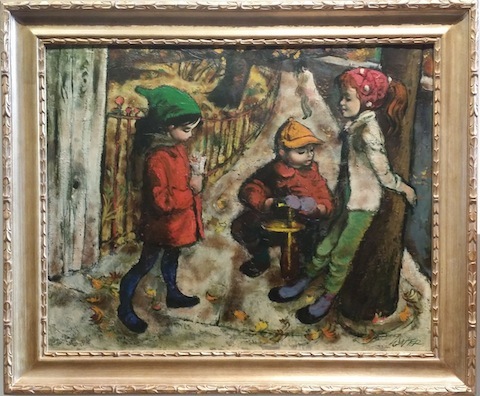 Reviewer Constance MacKay in the Vancouver News-Herald (January 3, 1948) praised Winter’s painting, Rosie, on exhibit at the Vancouver Art Gallery, for its rich, jewel like colours and called it “a timeless psychological study” of youth. 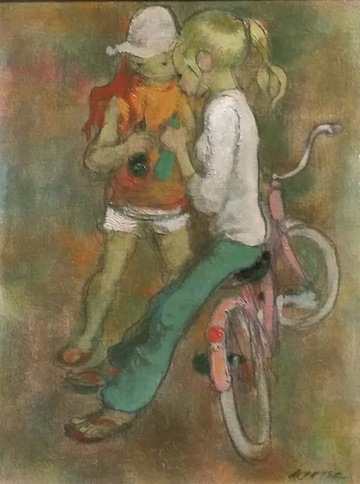 Living in Toronto from the 1940s onwards, Bill Winter became known in the 1950s for his lively city scenes, many depicting children in a modern realist style. His subjects also include portraits, figures and the prairie landscape. 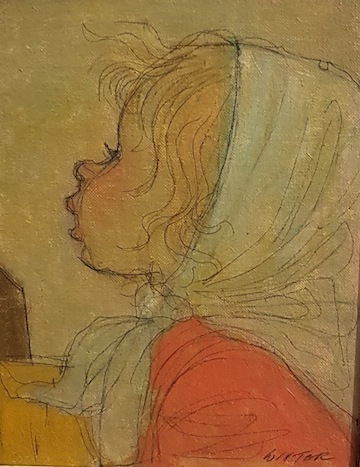 He painted in oil, acrylic, and watercolour, and drew with pencil and coloured chalk. 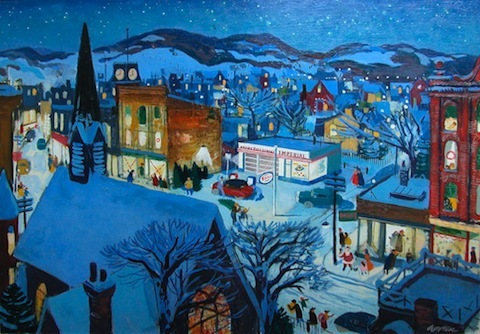 Paul Duval noted that some of Winter’s best work was produced from the 1940s to the early 50s, and included “penetrating studies of Toronto’s inner city.” Duval added that they captured the colour and conflict of downtown life, citing Winter’s painting, Midnight at Charlie’s, 1945, a social realist work depicting a man alone in a diner, which was exhibited with a Canadian Group of Painters exhibition in 1945. This work, now in the Vancouver Art Gallery’s (VAG) collection, was also included in the VAG’s 1982 exhibition, Canadian Pictures 1951, an historical recreation of their 1951 exhibit. In 1955, Winter left his career in commercial art to work as an independent artist. 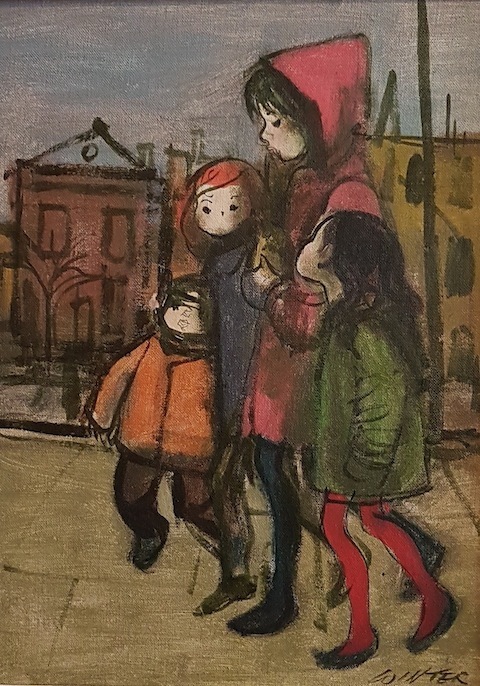 He deposited his RCA diploma painting, Street Scene, depicting a lively group of children playing on a side walk, at the National Gallery of Canada the same year. Later, Winter commented to a reviewer in the Brantford Expositor (October 19, 1960) on the meaning of another painting The Multitude, 1959, which included over a thousand figures, “I was thinking about the ‘population explosion’ and the ‘bomb’.” The painting had attracted a lot of attention due to its recent purchase by the National Gallery of Canada. By 1960 Winter had completed a number of mural commissions: Canadian Pacific Rail lounge car; the Robert S. McLaughlin Public Library, Oshawa; Standard Iron and Steel Company; Children’s Aid Society, Toronto, and Seagrams Ltd. In the 1960s, Winter taught drawing and painting at the Ontario College of Art and the Artist’s Workshop, both in Toronto. He had 19 exhibitions of his works at the Roberts Gallery in Toronto beginning in 1959. He also travelled and painted in Italy (1963) and Spain (1965), Greece, (1966) and Mexico. William Winter moved to England to live with his daughter in 1994 and died in 1996. Winter’s paintings are appreciated for their sensitive depiction of the attitudes and habits of children and youth in lively, colourful depictions. Although his application, technique and colour palette adjusted over the decades, his sense of movement and poise remained strong and transmittable. National Gallery of Canada, Artists in Canada database.